INDIANAPOLIS – At the end of 500 miles around Indianapolis Motor Speedway, it was a former Formula One driver who took the checkered flag. It just wasn’t Fernando Alonso. Six cars never seemed to spread the team too thin, and the main issue facing Andretti Autosport was the reliability of its Honda engines. Alonso put on a thrilling show and even led 27 laps – third-most in the race – but he was sent to the paddock when his engine blew with 20 laps remaining. “We didn’t build the thing that was smoking down the front straight,” said McLaren boss Zak Brown, who engineered Alonso’s trip to Indianapolis. Part of the reason Alonso was able to skip F1’s showcase Monaco Grand Prix earlier Sunday for Indy is because the McLaren team – and its Hondas – have grossly underperformed this season and Alonso is not a current title contender. In a Chevrolet for Team Penske, Castroneves briefly took the lead but couldn’t make it stick as Sato grabbed it back. Castroneves was disappointed to fall short of the four-time winners club – particularly since it was his third runner-up finish. A joyful Sato dumped a bottle of 2 percent milk over his head, received a kiss from the Indy 500 Princess and raised his finger in the air. Michael Andretti ran down pit lane to reach Sato’s crew, then rushed to hug his driver. 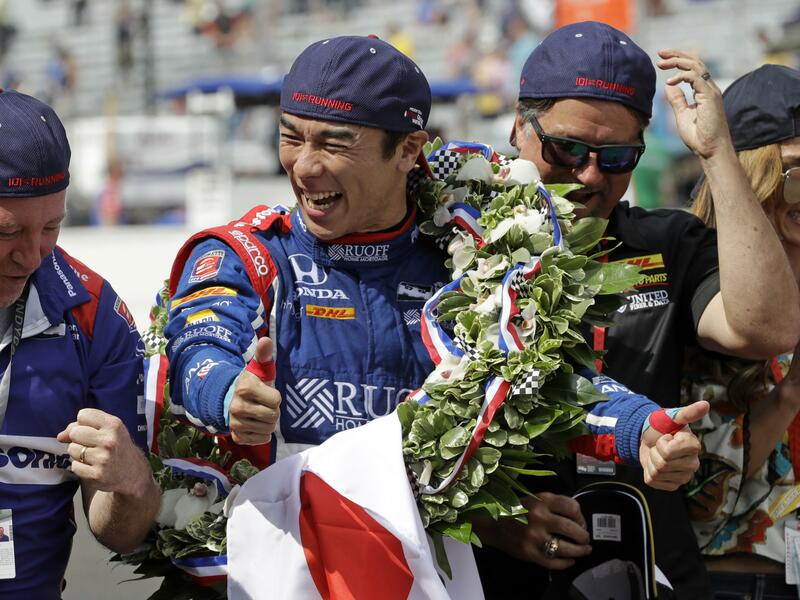 It was only the second IndyCar victory for Sato, who won driving for A.J. Foyt in Long Beach in 2013 – a span of 74 races. Ed Jones finished a career-best third and was followed by Max Chilton and Tony Kanaan, the highest finishers for Chip Ganassi Racing. Two-time winner Juan Pablo Montoya was sixth. Honda drivers took six of the top 10 finishing positions. Published: May 28, 2017, 4:39 p.m. Updated: May 28, 2017, 6:13 p.m.